If you’d like a more formal place to log readings, check out our Willows East Tarot Journal and Printables! Wait, But Which Deck Should I Use? Any Tarot deck (with 78 cards) will do! Beginners tend to prefer using the traditional Rider Waite deck. I've also had great success with some of the more illustrated decks, as they really seem to trigger my intuition! My favorite right now is the Ostara Deck. Absolutely! I use both hard copy and digital Tarot decks for my readings. And, if you're just starting out, using digital decks is a GREAT way to sample new decks and see which ones you like, before investing money in the hard copy versions! I love the Fool's Dog Tarot apps. You can find them by searching the Android or iOS app store for "Fool's Dog." Believe it or not, you can start reading cards right this very minute! You don't need any formal training to dive in! Ask a question, shuffle, pick one card, and see if the visuals in the card help you understand what the answer to your question might be. If you're really craving some more guidance, scroll to the bottom of this post for a "A Few Things to Keep in Mind" and a link to my Tarot Crash Course. Sometimes, honestly, it's better NOT to get too bogged down with information when you first begin reading the cards. Because, then your intuition HAS to lead. I'm going to take you through 3 Example Questions using only the visuals in the cards to guide my answers. Please play along with your own deck, and share any interesting insights in the comments below! For each question, I've shown the card I chose in 3 different decks (1, Traditional Rider Waite; 2, Bonefire Tarot; and 3, Ostara Tarot) to give you an idea of some different visual cues you may find in different decks! 1. Who Am I In This Moment? Focus on the card you've drawn. Pick out one or two things you find interesting about the image and see how it applies to each question. Write down the questions and answers in your notebook. Remember: there is NO wrong answer. 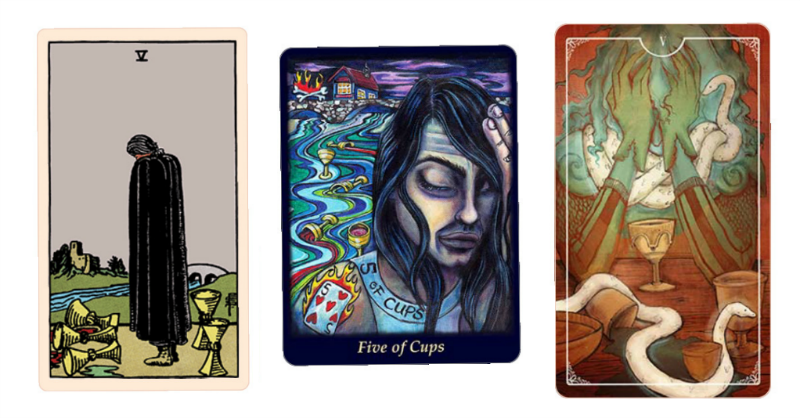 5 of Cups - In all three of these 5-of-Cups cards, the character looks defeated, dejected. But I want to dig a little deeper and see what other visuals catch my attention. For example, I hadn't really noticed before that the figure in the first card is so heavily cloaked in dark fabric. And, looking at the other cards, there's a darkness in each of those characters as well. The character in the second card even has a tattoo of the 5 of Hearts/Cups, and the character in the 3rd card is tangled up with a snake. To me, this feels like the disappointment the person is feeling is (at least in some way) self-imposed. With how I'm personally feeling at the moment, I understand this to mean that I need to focus on the positive as much as possible and try to let go of feelings of helplessness. 4 of Pentacles - Wow, these 4-of-Pentacles cards are all so different! In each of these cards, though, it doesn't feel like the person is exceptionally wealthy. It seems as though the characters have come into money perhaps even by chance. The character in the second card even seems to be hiding his treasures in a tree. In cards 1 and 2, the men are holding their fortunes close to them. In applying this to my business, it's exactly how I'm feeling right now -- like I have this little gem that I want to keep close, because I'm not exactly sure what to do with it or which direction to take. The second card also reminds me that the items held most dear appear to be symbols of marriage (a ring), love (a locket), and home (keys). A good reminder to lead with those values in mind. For you, the card interpretations may be completely different. You may be drawn to the scene in the background, something the character is holding, etc., and that's OK! 3. What Do I Need to Know About My Love Life (Or A Specific Friendship/Relationship)? 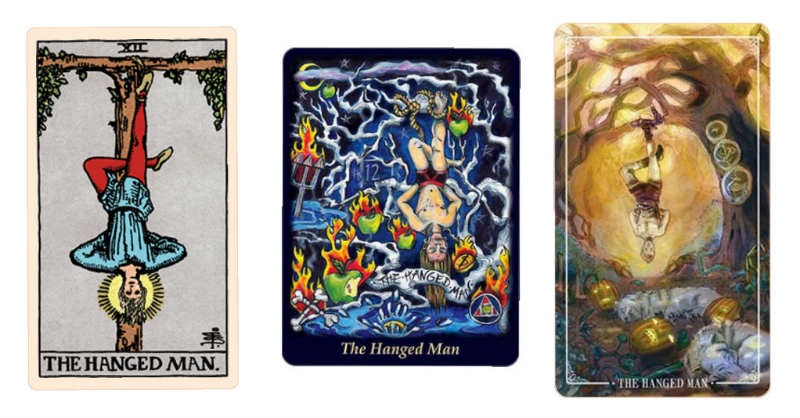 The Hanged Man - I focused on the relationship with my husband. I know that the Hanged Man is typically a card of "new perspectives" or a new way of seeing things, but I wanted to push myself to focus on the visuals only. In the second card, I was drawn to the number 12. Interestingly, December (the 12th month) is our anniversary month. This could mean that this coming month will be pivotal in our marriage. All of these cards have plants or fruit, and this reminds me that, even after 13 years of marriage, we're still growing and learning about each other. Maybe we need to see each other differently, to keep our marriage fresh. Who Am I In This Moment? I'm feeling helpless and defeated, but this may be self-imposed. What Do I Need To Know About My Career? I'm holding on tightly to what I have, perhaps afraid to let it grow. What Do I Need To Know About The Relationship With My Husband? December may be an important month for us, and we can still keep our relationship fresh and exciting. How can I overcome these feelings of helplessness and defeat? How can I begin to let go of what does not serve me well and move forward in my career? How can my husband and I keep our relationship exciting? To overcome feelings of defeat, the Strength card literally reminds me to trust my inner strength. The woman is also calming a dragon, which I feel like represents my emotions and anxiety. This tells me that I need to make time for self care. The Moon and Sun symbols in this card remind me that I may need to schedule time to do all that I need to get done in one day. To let go and move forward, this character is just going for it. He's doesn't seem to really be thinking things through completely or planning very well. I mean, his face wrap is falling apart, and he's following some dog/fox-like creature into battle. This may not end well. Haha! But, that's OK. So, I think the message for me here is to just go for it; to learn as I go! To keep the relationship with my husband fresh and exciting, this little mouse reminds me that small gifts and gestures go a long way. All this little mouse has to give is one tiny coin he found. I'm reminded of the saying, "Do small things with great love." My husband brought me coffee this morning at the office, on his way to work. And I can give back to him in simple ways too. The deck is made up of 22 Major Arcana cards (typically designated by roman numerals and representing bigger life lessons or themes); 40 Minor Arcana cards (numbered Ace to 10, in 4 suits: Cups, Pentacles, Wands, and Swords); and 16 Minor Arcana court cards (Knight, Page, Queen, and King, in the same 4 suits). Cups tend to represent emotions and relationships; Swords would be thoughts and willpower; Wands would be passion/drive and work; and Pentacles would be material objects/finances and earthly matters. Court cards can represent themes or people in your readings, including yourself. I use this key to understand the energies of the court cards: Page = Teenage Energy (driven, sometimes aloof, misguided, or unfocused); Knight = 20/30-year-old (driven, goal-oriented, focused, willing to do the work, can't always see the big picture); Queens/Kings = Motherly/Fatherly (wise, intelligent, fair, noble, supervisory, strong). Want to dive deeper into card meanings and exercises? Check out my Free Tarot Crash Course! Main Post Photo By Alexandra Gorn. Weekly Tarot Journaling Pages - Freebies & Paid Pages!